A truly good doom album is a sea of sadness, a wide, deep, morass of gloom that the listener can plunge into and become lost. And as good as traditional misery-merchants such as My Dying Bride are, the steps beyond taken by the more extreme funeral doom bands are ones that never fail to grip in a different way. Bell Witch are relative newcomers to the scene, having only formed in 2010 and released one album before this, but on the strengths shown in Four Phantoms could be veterans. (Members Dylan Desmond and Adrian Guerra have done time in bands like Samothrace and Shadow of the Torturer, so the experience is definitely there.) As suggested by the title, the four tracks here each tell a different story of horrible death and endless haunting, elementally focused into earth, fire, water, and air, and reflected in the beautiful cover art by Paolo Girardi (who has produced a lot of wonderful pieces for everyone from Artificial Brain to Inquisition). 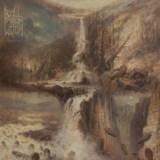 And when married to a name with as much supernatural history behind it as the Bell Witch, we have the ingredients for a truly atmospheric doom album, which the band duly deliver. Flashes of melody erupt here and there, but all else is crushing riffs and engulfing drones, the useless struggle against an inevitable death. The end is especially good, death-rattle growls atop a mournful yet tuneful melody as the vocals turn clean and the track becomes grandiose. This epic air is carried into Judgement, in Fire: I – Garden (of Blooming Ash), fiery riffs droning ceaselessly under a powerful growl, before fading into a beautiful ambience for much of the remaining song time, clean singing and breathy whispering atop.